Fondue is good and gives a good mood. This famous Swiss saying, FIGUGEGL, created in the 1950s by a Swiss advertising agency on behalf of the Swiss cheese union, aim was to encourage the Swiss to eat more cheese! The campaign can be hailed as a roaring success with FIGUGEGL becoming synonymous with eating Fondue amongst the Swiss. The Swiss cheese union were also instrumental in elevating the Fondue as a Swiss National dish in the 1930s. And lest anyone is confused, when the Swiss talk about fondue, they are most likely not talking about the chocolate one. Although delicious, you won't find chocolate fondue gracing the tables of the average Swiss family. Cheese is the most popular was to enjoy a fondue, followed along with Fondue chinoise (like a hot pot) and Fondue bourguignonne (meat cooked in oil). The one thing about cheese fondue however is that it's really stinky. You entire home will stink of the melted cheese goodness if you don't make sure all the bedroom doors are closed and you don't give your home a good "lufte" afterwards. But who said Fondue should only be enjoyed indoors? If the restaurants on the ski piste can offer fondue on their outdoor terraces, why can't we eat it outside too? I realised that we had never been that adventurous with our fondue eating. 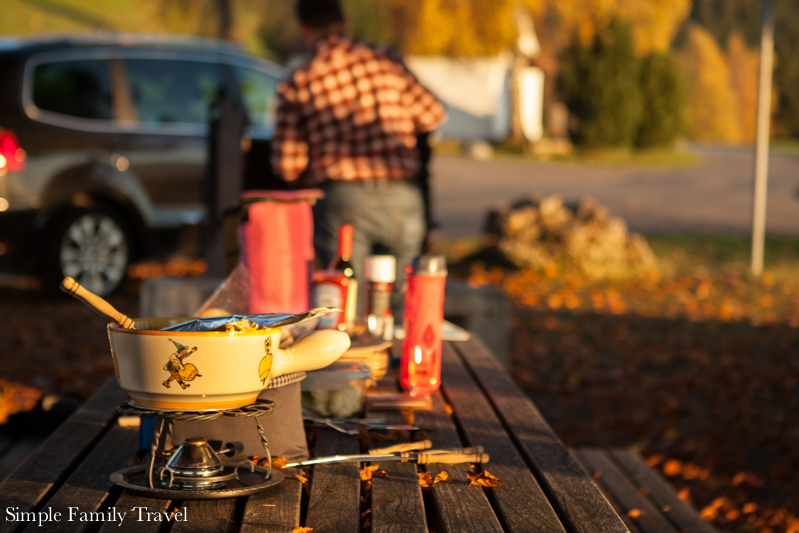 SFT contributor Pamela inspired me, with her story of taking guests up to the mountains to enjoy a Fondue in the back of her Mercedes Camper, to pack up my fondue pot and to enjoy fondue with a view. After all fondue is one of the most portable treats you could eat. And why in the world were we reserving it for the weekend? One late afternoon we headed up the mountain and enjoyed our fondue by sunset. Seriously the best idea ever! I packed up a picnic basket with our fondue pot (called a caquelon), the stand and burner, forks, cubed bread, and a packet of prosecco-laced fondue mix we purchased from Käse Dubach. For the picky kids who don’t eat fondue (more for us!!!) we brought a long some vegetable sticks and some Portuguese steaks for the BBQ. We couldn’t have chosen a better night. The sun was shining and it was still warm enough to run around without a coat on. With the sun setting over the alps, we dunked our bread into the bubbling fondue, being careful not to loose it in the molten cheese mixture. After all, in our family who looses their bread into the fondue has to wash up the dishes. We were able to cook the fondue just over the heat of the burner of the fondue stove. It took a little longer than it would have if first cooked over a normal stove, but it did work. Don’t own a fondue set? No worries! Use (or borrow!) a camping stove and a saucepan, it does the job just as well. Make sure you bring a spatula along to scrape out the last sticky bits of cheese. 1. Keep on stirring!! You don’t want the cheese to stick to the bottom and burn, so each time you dip your bread into the pot, stir the bottom to make sure it doesn’t stick. 2. Chop your bread such that each little bite size piece has a little bit of crust - if you stick your fork through the crust, you are less likely to lose your bread in the fondue. 3. Don’t lose your bread in the fondue! Our family rule is that if you lose your bread in the fondue you will have to wash the dishes. Other families may make you take a shot of Kirsch (clear cherry brandy), buy everyone a round of drinks or even kiss the person sitting next to you. You can make up your own funny tradition. 4. Fondue is traditionally served with white wine, and for the more adventurous, Kirsch, is traditionally served alongside fondue as the beverage of choice. 5. If enjoying fondue away from home, always bring some sort of spatula along to help remove the last little bit of sticky fondue. And soak your pot and forks as soon as you return to your home. 7. No double dipping! Stir your bread in the melted cheese until the bread is coated. To prevent the cheese from slipping off the bread twist the fork around a bit as you bring it to your plate. 8. Our favourite type of cheese fondue is Moitié Moitié which is equal parts of Gruyère and Fribougeois Vacherin cheese but there are plenty of variations. If you can’t find Swiss cheese, look for strong cheese that melts easily. A bit of corn starch will help prevent the cheese mixture from splitting when it gets hot. Don’t have a local cheese shop that can mix up a fondue for you? You can get adventurous with my father-in-law’s “famous” fondue recipe! Pepper, paprika and a touch of nutmeg for seasoning. 1. Rub the fondue pot with the half clove of garlic. 2. Mix the Kirsch and cornflour together set aside. Use enough Kirsch so help the cornflour dissolve. 3. Pour the wine into the pan and add pepper, seasonings and baking soda. Mix in the grated cheese and move to the stove. 4. Mix the cheese mixture on a high heat until the it starts to melt. Turn the heat down and continue to stir. Never stop. 5. When the mixture has melted, add in the Kirsch/cornflour and stir well. 6. Move the pan immediately to the burner and start to eat straight away.